Environmentalism becomes identified with the left when collectivism and centralization are seen as the only solutions to ecological problems, just as they are also assumed to be the only solutions to economic and social problems. The challenges facing us in the Anthropocene (climate change, water scarcity, food insecurity) are held to be too big for local governments. There’s nothing for the individual or the small association to do but suffer in quiet desperation. In a similar flattening of political options conservativism become identified with market solutions to every problem and clean air and water are commodified. There is nothing especially left-wing about preserving wilderness and bio-diversity, and promoting local self-governance and rural life. Environmentalism, or more specifically integral ecology, is too big for partisan politics. Just as opposition to Nazism in the WWII mobilized both sides of the democratic political perspective, so too must Anthropogenic Climate Change and the 6th Great Extinction Event which we are currently experiencing. To put it positively, there are solid historical grounds for a conservative environmentalism just as there are for a leftist environmentalism, and FANE needs both. At their ideological worst, the left and the right are in fact enemies of the environment. Ideological leftists, in the interest of equality and “deterritorialization,” would sever the bonds of attachment that are the root of moral life. Ideological conservatives, on the other hand, would privatize wilderness and preserve, as the way of nature, the economic inequality, which Pope Francis rightly points out is essentially linked to environmental degradation. Integral ecology is realistic and cannot tolerate too much ideology. For every armchair Marxist dreaming about the revolution, but not actively pursuing it, since it would interfere with his standard of living, there is a conservative waxing nostalgic for a social hierarchy that has long been demolished by capitalism, along with fox hunting and country squires. The ideological left whines for a world that has never existed, the ideological right pines for one that no longer exists. 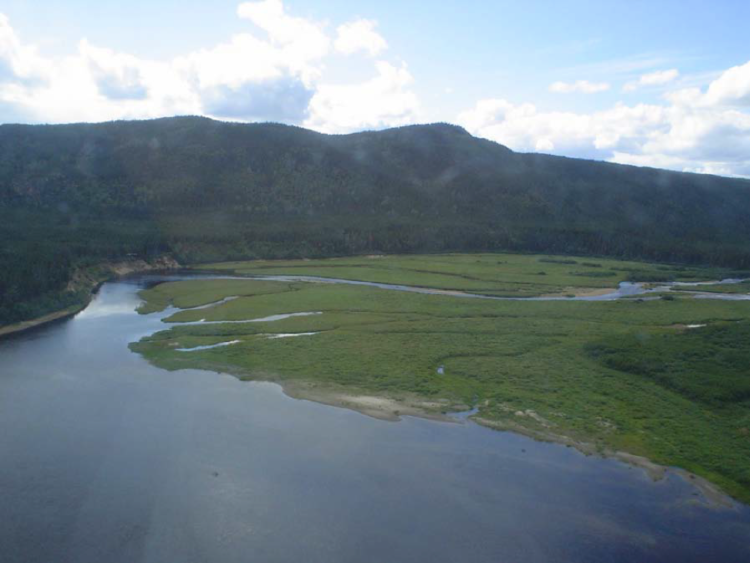 A large expansive wetland at the Elizabeth River confluence with the Lower Churchill River, Labrador. This will disappear when the Muskrat Falls Dam is operative. Photo courtesy of Ian Goudie. In his 2012 book, How to Think Seriously About The Planet: The Case for an Environmental Conservativism, British philosopher Roger Scruton, opposes his form of traditional conservativism to neo-conservativism, and argues for a more historically nuanced understanding of the left-right divide. His argument is that the left’s top-down solutions to environmental problems require the creation of unaccountable bureaucracies that are ignorant of local conditions and produce unwanted if unintended consequences. Environmental conservatism by contrast promotes “local initiatives over global schemes, civil association over political activism, and small-scale institutions of friendship over regulatory hyper-vigilance.” Scruton criticizes the current view of left-right politics as an overly simple opposition of State v.s. the free market. His form of conservativism does not believe in market solutions to every problem. The break-down of the family, for example, does not admit of market solution. What is truly at stake in left-right disputes according to Scruton is a conflict of opposing modern social ideals, which he describes as “collective egalitarianism” v.s. “the free association of individuals.” Viewed from this lens, we can see leftist and rightist environmentalism leading to two forms of social and political association: “movements with causes” on the left, and “civil associations that are ends in themselves,” on the right. Think of the difference between Greenpeace and the East Coast Trail Association on the Avalon Peninsula of the island of Newfoundland and you will get the gist of his argument. The members of Greenpeace are galvanized into a trans-national unit by commitment to a common cause, which overrides the differences between them. Dis-identified from their nations and cultures, they are unelected by any community and unaccountable to any demographic. The members of East Coast Trail Association are united in their common attachment to a particular hiking trail and the fellowship and stewardship that arises from regularly walking it and maintaining it. These two forms of social and political life, Scruton continues, lead to two proposed solutions to environmental crisis: appointing someone to take charge (the left-wing solution) or creating incentives that will lead people to solve them for themselves (the right-wing solution). Thus for Scruton the distinction between left-wing and right-wing environmentalism is at bottom the difference between control and incentive. While I appreciate these nuanced distinctions, Scruton’s book leaves me uncomfortable. How can integral ecology decide between control and incentive? Is it not obvious that both are required at different times and in different situations? Corporate reduction of greenhouse gas emissions requires State control and “hyper-vigilance”; the stimulation of local sources of food production requires small-scale incentives. Moreover, not all “movements with causes” are controlling. As a theologian (and I realize that I do not speak for all friends of FANE), I have from the beginning thought of FANE as spirit-directed. I believe integral ecology calls for a re-sacrilization of the earth, which is not a strategy for the re-enchantment of nature; the future, if there is one for us, will see the universalization of a sober reverence for our common home. In his devolving of all environmental decision to local associations of land owners and legal citizens, Scruton seems to be missing the thought that a spirit that transcends individuals and nations might be moving society towards egalitarian community both through free associations and various efforts to legally and politically coordinate them on a shrinking globe. If the temptation of the left is to mistake the State for the agent of moral existence, the temptation of the right is to assume that free associations are always morally responsible and adequate to our global situation. FANE advocates planetary citizenship, and nationalist and cultural attachments to the degree that they promote it. We love book clubs, birding societies, walking groups and farmer’s markets, and wish there were more of them. The abolition of private property and the collectivization of land is not the solution: human beings care most about that which belongs to them and that to which they belong. George Grant rejected Marxism because he believed, on solid philosophical and psychological grounds, that love of one’s own is the beginning of the love of the Good. What else is the Muskrat-Falls fiasco but the result of a State imposed mega-solution to a community’s energy problem, which floundered precisely because it created an unaccountable bureaucracy (Nalcor) that was ignorant or neglectful of local conditions, leaving unintended economic and political chaos in its wake? We cannot leave the solution to climate change to civil associations. We need global leadership that will not render passive those local elements in society that are essential for ecological conversion: that means collective solutions that promote rather than preclude local incentives for action. This entry was posted in ecology, religion, writings. Bookmark the permalink. ← What’s Next for Muskrat Falls?